To the surprise of few neighbors, DNAInfo Chicago yesterday reported that more people are cited for public urination under the Addison Red Line tracks than at any other location in the city. While cash-strapped Chicago will certainly continue to address the issue with revenue-raising $300 citations, other cities around the world have taken a different approach. 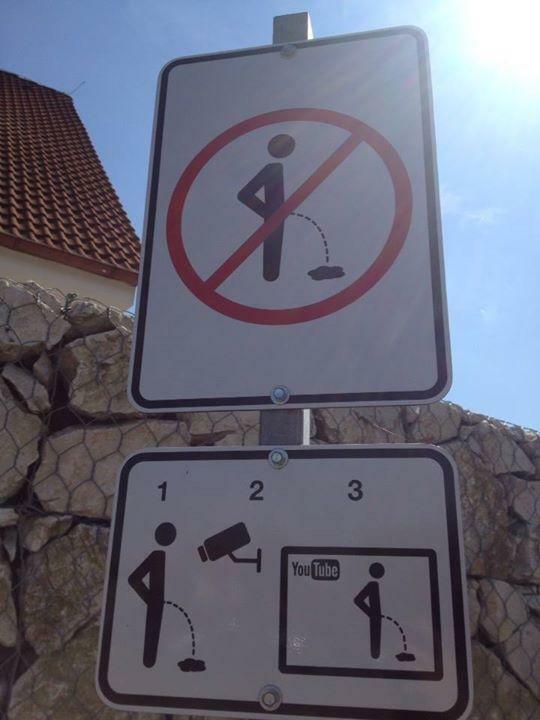 A hotel in the Czech wine-making town of Mikulov uses the threat of YouTube to discourage people from peeing outside their establishment. The sign, seen here, says it all. Hamburg, Germany, and San Francisco have taken a different approach. Both cities have deployed liquid-repelling paint on key areas. Anyone who pees on a treated wall will find that the wall immediately shoots their pee directly back onto them. This Washington Post story includes a couple of short videos to demonstrate the repellant properties. Although, the sight of green "urine" is rather disconcerting.